The Twelve Nidanas (Pali: nidana— foundation, source or origin) are the application of the Buddhist concept of Pratitya-samutpada (dependent origination). The Twelve Nidanas are employed in the analysis of phenomena according to the principle of Pratitya-samutpada. The aim of the Twelve Nidanas analysis is to reveal the origins of phenomena, and the feedback loop of conditioning and causation that leads to suffering in current and future lives. The basic principle of pratitya-samutpada and the Twelve Nidanas is to see the conditioned causal connection of each state that supports the next in the cycle of our lives as we suffer in Samsara. 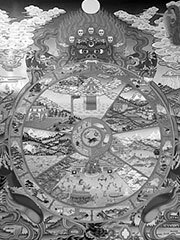 It is explained in detail in the Visuddhimagga of Buddhaghosa, the central text of the Mahavihara commentarial tradition. The causal chain of analysis employed in this type of analysis appears to operate from the position that individual phenomena are caused or conditioned by only a single cause. This reflects not a blanket declaration by the Buddha Shakyamuni or the Theravada commentators that individual phenomena can have only a single cause, but rather a simplifying assumption employed to make the analytical technique more useful to the practitioner. Like many of the techniques and theories contained in the Visuddhimagga and other commentarial works, the Twelve Nidana analysis was intended to be used as one of many techniques available to a student of meditation, and its form reflects both the needs and experiences of Buddhist meditation practitioners. The chain of twelve phenomena leading to future births and suffering was variously presented by the Buddha; Buddhaghosa recounts four methods- working from ‘bottom to top’, working from the ‘middle to the top’, working from ‘top to bottom’, and working from the ‘middle to the source’ (Buddhaghosa compares the teaching of the Twelve Nidanas to a creeper vine that is seized and removed in one of four different ways). The first method begins with ignorance and proceeds to sickness, old age, and death. The second method begins with attachment and proceeds to birth. The third method begins with birth and proceeds back to ignorance. The fourth method begins with attachment and proceeds to ignorance. Ignorance of Four Noble Truths, Three marks of existence, Five Skandhas, Karma, and Pratitya-Samutpada. This is the primary cause of Dukkha, suffering dissatisfaction, pain, unease, etc. Mental Formations and Volitional Will. Mental constructs, based on a non-existent «I» or «Self». Nama the naming activity of the discursive mind and Rupa its attendant form, without which mind cannot exist. The six senses are eye/seeing, ear/hearing, nose/smelling, tongue/taste, skin/touch, mind/thought. Apart from the five senses which we are familiar with, in Buddhism, the sixth sense is the mind, and the object of mind is thought. Sadayatana refers specifically to the six sense organs. Contact between the eye and tree, between the ear and drum, nose and perfume, tongue and salt, skin and cut, mind and thought. Sensation refers to the quality of feeling. Is it pleasant, unpleasant or neutral? Swimming on a hot day — pleasant. Sharp stones under a bare foot — unpleasant. Bum on a chair — neutral. Desire is sometimes described as the cause of suffering : a constant dissatisfaction, frustration. Attachment of all kinds, to persons, to life, material comfort, pleasant sensations, to unpleasant sensations too. There is also attachment to beliefs, thoughts, ideas/ideologies. (Sometimes resulting in clashes, confrontations, fighting, or even wars). The steps or actions taken to recreate, that which was craved or desired in step eight above Tanha. Bearing fruit of the previous ten steps. That which was desired and conditioned now comes to be. That which is born, dies. All conditions, all experiences must end. Conditions, reason, source, génitor are described by the Visuddhimagga as the same. Conditioning an agent means to cause it, being taken as an object by it, to occur in the same time. The full list helps to consider many sorts of conditions as the causal condition is only one of them.Examples are explained to understand these conditions, but they are included in the next section in order not to repeat them. Both a condition and a cause. Each condition responds to this principle to be both a condition and something else. Note that a cause does not transmit any «substance» — see Three marks of existence. An agent that helps another one by being its object. All that can be known can be an object condition. An agent that helps another one by mastering it. An agent thats helps another one considering its immediacy. Same meaning as the immediacy condition. An agent that helps another one by appearing on the same time «as the lamp for the light». Agents that help themselves and consolidate themselves are one for the others «reciprocity condition». An agent that helps another one by being a basement for it. An agent that helps another one by appearing before it. A psychic agent that helps an older and physical one reenforcing it. A state of mind that conditions a following and similar state of mind. An action that is an intentional effort. A serene state of mind helping another one to be serene. The four «foods» : the food helps the body, but «psychic foods» helps associated factors. For example, the ocular faculty helps the ocular conscience. The jhanas are said to be associated with some characteristics : vitakka, vicara, piti, sukkha or on the contrary upekkha and ekkagata. Jhanas are conditioning these. The way to leave the samsara. Some factors are associated with this way. The four non-physical skandhas help themselves by being associated to the same object. Physical and non-physical agents helping themselves by not being associated to the same object. For example, a calm state of mind helping some physical aspects to be — but not always to appear, as the dissociation condition can be anterior, posterior or simultaneous..
An agent helping another, similar one by making it strong. Non-physical agents, ceasing, help another one to appear. Same as the inexistence condition. Same as the existence condition. This section considers which conditions apply to which part of the dependent origination. During rebirth, the four psychic aggregates condition the sixth domain as simultaneity, reciprocity, support, association, result, existence and non-disparition. The five physical domains condition the five physical contacts as support, anteriority, faculty, dissociation, existence and non-disparition. The mental domain conditions the mental contact as simultaneity, reciprocity, support, result, intake, faculty, association, existence and non-disparition. The visible domain conditions contact with the eye as object, anteriority, existence and non-disparition. The other exterior domains represent the same conditions : for example sound for the contact with the ear. This description considers only the 32 sensations associated to resulting states. Contact with the eye, the nose, the ear, the mouth or the body conditions the sensations which are supported by the associated sensibilities as simultaneity, reciprocity, support, result, intake, association, existence and non-disparition. Contact with the eye, nose, ear, mouth and body also conditions the other sensations as strong support. The only case is the resulting and nice-to-have sensation conditioning craving as a strong support. Sensorial lust conditions as strong support sensorial attachment. Sensorial lust conditions other attachments as simultaneity, reciprocity, support, association, existence, non-disparition and causal conditions. Every attachment conditions every becoming. The four attachments condition pure physical becoming and non-physical becoming ( see dhyana and arupajhanas ) as strong support. Attachment conditions beneficial physical becoming as strong support. Attachment conditions pernicious becomings as simultaneity, reciprocity, support, association, existence, non-disparition and causal conditions. Becoming conditions the birth as a karma and strong support condition. Birth conditions both old age, sickness, death, sorrow as an extreme strong support condition. Bhadantacariya Buddhaghosa, Bhikkhu Nanamoli (trans. ), The Path of Purification, Seattle Pariyatti Publishing (Buddhist Publication Society), 1999. ISBN 1928706010. See Chapter XVII.